Subject access. Here, a logical access control uses some means to determine the identity of the subject that is requesting access. Once the subject’s identity is known, the access control performs a function to determine if the subject should be allowed access the object. If the access is permitted, the subject is allowed to proceed; if the access is denied, the subject is not allowed to proceed. An example of this type of access control is an application that first authenticates a user by requiring a user ID and password before permitting the user to access the application. Service access. Here, a logical access control is used to control the types of messages that are allowed to pass through a control point. The logical access control is designed to permit or deny messages of specific types (and possibly it will also permit or deny based upon origin and destination) to pass. An example of this type of access control is a firewall or screening router that makes pass/block decisions based upon the type of traffic, origin, and destination. An analogy of these two types of access is a symphony hall with a parking garage. The parking garage (the “service access”) permits cars, trucks, and motorcycles to enter, but denies oversized vehicles from entering. Upstairs at the symphony box office (the “subject access”), persons are admitted if they possess a photo identification that matches a list of prepaid attendees. This entry was posted in application security and tagged application security, logical access control on August 27, 2009 by peterhgregory. The need to protect your mission-critical communications system and business applications should be considered from the very start of our converged network planning. Is your converged voice, video and data network safe from threats, both internal and external? Download this E-Guide for best practices for converged network security. My apologies if this sounds like an ad. This is a cut-and-paste from TechTarget for an e-book I wrote last year. This entry was posted in application security, my books and tagged converged network security, converged networks, e-books on December 5, 2008 by peterhgregory. I am a customer of an international company whose logo is highly recognizable and whose brick-and-mortar services I use frequently. I pay for these services by credit/debit card on their website. I noticed two months ago that the website has a vulnerability that exposes credit card numbers through form field caching, which means that public-access computers could expose credit card numbers (and security codes) to others. I have contacted the company three times in the past six weeks. Their website makes it impossible to know who their security people are or which continent they work on (this is a company that has presence in over 100 countries). I have written the press office three times. None of my communications have read by a human, as far as I can tell. I will be giving them another week or two before I go public. I’ve told them so in every way that they make available. After telling them almost two months ago, I logged on today and the vulnerability is still there. It is SO easy to fix – it does not require any changes to their data model, workflow, or processes. All they have to do is add an ‘AUTOCOMPLETE = “off” ‘ to two fields in one form and they’re done. As a security professional I am duty-bound to inform this organization. I’ve done so many times, and have not heard any response. If they continue to turn a deaf ear, I will go public in April. This entry was posted in application security, identity theft, incidents and tagged autocomplete, credit card numbers, identity theft, PCI, vulnerability on March 29, 2008 by peterhgregory. A parameter tampering attack is a malicious attack on an application where the attacker is manipulating hidden form variables in an attempt to disrupt the application. Effective input field filtering. Input fields should be filtered to remove all characters that might be a part of an input injection. Which characters are removed will depend upon the types of software used by the application. Application firewall. Network firewalls inspect only the source and destination addresses and the port numbers, but not the contents of network packets. Application firewalls examine the contents of packets and block packets containing input attack code and other unwanted data. Variable integrity checking. If you application uses values in hidden fields to communicate parameters from page to page, you need to consider adding a variable that is a computed hash of other variables. Make sure your algorithm for hashing your hidden variables is not easily guessed – or consider using encryption in addition to hashing. 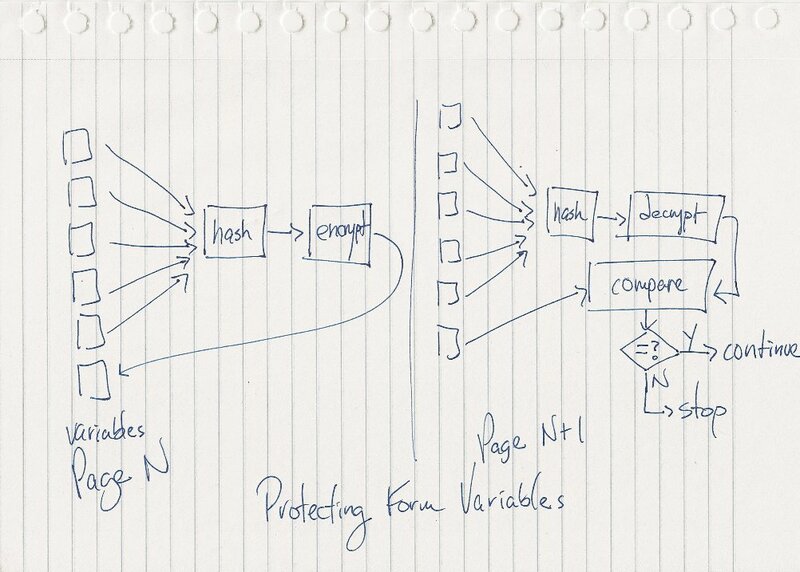 When each page begins to process its variables, compute the hash again and compare it to the hash value variable. If the values are different, you know that your variables have been tampered with and you can exit gracefully after logging the incident. Application vulnerability scanning. Organizations that develop their own applications for online use should scan those applications for input attack vulnerabilities, in order to identify vulnerabilities prior to their being discovered and exploited by outsiders. These countermeasures lower the risk of parameter tampering by making the application more robust and/or protected from input attacks. Countermeasures for input injection attacks. This entry was posted in application security, Tips and tagged application firewall, input attack, input filtering, parameter tampering, peter h. gregory, vulnerability scan, web application security on March 2, 2008 by peterhgregory. An input attack is a malicious attack on an application where the attacker is inputting data in an attempt to disrupt the application. Two of the most well-known input attacks are buffer overflow and script injection. These countermeasures lower the risk of input injection by making the application more robust and/or protected from input attacks. Countermeasures for parameter tampering attacks. This entry was posted in application security, Tips and tagged application firewall, input attack, input filtering, vulnerability scan, web application security on December 26, 2007 by peterhgregory.